I hope all our readers are having a Merry Christmas! I know a lot of you are getting (or giving!) Them Days gifts, so enjoy! Our office will continue to be closed for the holidays until January 5. Have fun everyone! Last minute shoppers, this message is for you! Still need to get a couple of gifts? Head on over to Them Days! Them Days calendars are only $10, tax included. Them Days Christmas cards are only $5 per pack of 4, tax included. Boxes of 99 back issues are available for only $99 + tax. Also, we have a few photos left for sale from our craft fair tables. The photos are matted and in simple glass frames. Most are $10 (tax included) and are in 8 x 10 frames. We close at noon on Christmas Eve, so come on in and get those last-minute Christmas gifts! You know big things are happening at Them Days when you go out to check the mail and then see this crane out back! I guess they were doing something with the roof, maybe putting the trusses on. Here you can see the crane from the front (well, sort of). I love how cozy the Them Days building looks inside! These photos were taken on Wednesday afternoon. This morning I took a peek in the back of the building because I’d seen it from afar while starting my walk home after work, but not close up, and I knew a lot was happening this week. It’s so exciting to see a real building shape up! As you can see, the building now has walls! Not just skeleton walls, but honest-to-goodness walls. Here's a view of the annex that will connect new and old. Where's Lauren when you need her to open invisible doors? As you can see, the building of the walls means that you can imagine much better how the building will look, with a door and all. Lauren, if you are reading this (she’s on House Manager duty back at the Katimavik house): We miss you! Can’t wait to see you again on Monday! Also, if you’re one of our customers and you still want to get some Them Days goods for under your Christmas tree, we will be open Mondayand Tuesday all day (8:30 – 4:30) and Wednesday morning (8:30 – noon) next week. It’s not too late to pick up a calendar, Christmas cards or a set of 100 back issues! 32.4 is out in the world! Issue 32.4, coming to a mailbox near you! Can’t wait to get it in your hands? Here are a few photos which should whet your appetite. They are of Charlie Russell (of Labrador City, formerly of Port Hope Simpson) and his family with their dogs. Dog sledding is a family activity for the Russell family. You can read all about Charlie’s experiences with dogs in “Keeping The Tradition Alive” on p. 61 of your latest copy of Them Days! Also, if you haven’t been to the Them Days home page lately, you should check it out! We’ve just added the Labrador Virtual War Memorial to the site. It was formerly hosted on Michael Martin’s Wonderstrand site, but has found a new virtual home at themdays.com. P.S. Thanks go out to Margaret Goudie Parsons, who helped us out once again by stuffing the subscriber envelopes during the mailout. Your help is much appreciated, Marg! Despite the snow, construction still seems to be going ahead. The latest update from out back is that there are walls! Well, sort of. The ‘bones’ of the building are up. That's where our archive's door will be. Lauren is pretending to open it. I have to vouch for her sanity though, and mention that she only does these silly things because I ask her to for the blog. Such a good sport and all-around great Katimavik participant! This what it looks like so far! This is where the extension will connect with our current building. We call it The Annex. It will keep our archive safe from any fire that may happen in the main building. Also, you can see where they will be tearing down part of the wall in the current archive! So, when I use Photoshop on the images, it wants to make them look like this. The thing is, the dull gray of the rest of the photos is actually accurate to what it looks like outside. But if you look at this photo, you can imagine what it looks like on a nice day! So yesterday was my first snow day here in HV-GB and I must say I was impressed. I had heard rumours of such a day but as I looked out my window early Monday morning, I was nearly blinded by the sheet of snow that had covered our back yard. And I wasn’t the only one who knew of this miracle seeing as my fellow group members were all suited up, ready to shovel it all away by the time I rolled out of bed. It was a five man job as many of my friends did their best to clear the driveway; it even came down to using a rake to free our katima-van. As I watched them all work relentlessly from the living room window, while eating my toast with jam and drinking my coffee, I thought to myself “huh, I don’t have to work today”. And as this epiphany slowly dawned on me, I started to dance and sing ” I don’t have to work to-day”. But of course, there is no such thing as snow days in Katimavik, so I was given the tough decision of helping out at either Paddon Home or the SPCA and although the idea of playing with cute puppies and kittens is tempting, I opted for Paddon Home for the simple reason that they had Bingo on Mondays. So away I went with 2 other accompanied katimavik buddies to spend the day assisting the assited living. We spent the day meeting and greeting with the grandmas and grandpas of Happy Valley, listening to stories and singing along with them in church. Most of them had more energy then myself, it seemed. Even more so when it came down to those final rounds of Bingo and everyone was vying for a piece of the Jackpot ($10.00). I sadly did not win but that did not put a stop to the fun I had at Paddon Home on that snowy Monday. The only thing that truly did was leaving it behind at the end of the day. The December issue of Them Days (32.4) will be here soon! We just heard from our printers that it’s finished printing and will start its trek to Goose Bay today. (Of course, transportation is completely dependent on the weather, and we just had a snow storm yesterday that shut down the town, so it’s possible that the transportation will be a bit slower than usual.) Cross your fingers – you may have your copy of Them Days in your hands by the end of the week if all goes well! 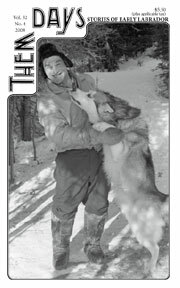 This issue is all about dog teams and the contributions they’ve made to Labrador. I’m sure you’ll love it!